River crossing puzzles are incredibly common, and popular in everything from puzzle books to pop culture works. They pose fun little problems, which could take a while to figure out if you're missing a crucial element, but once you know the solution all of these puzzles become incredibly easy. Perhaps the most popular ones are The Fox, Goose, and Bag of Beans Puzzle, The Jealous Husband Problem, and the Bridge and the Torch Problem. 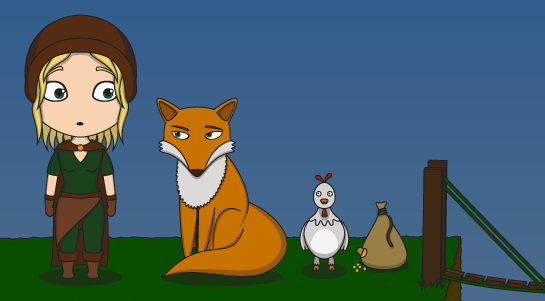 They all have a wide variety of alternate versions, the one I will be using is The Fox, Chicken, and Sack of Grain. A traveller is faced with a bridge, which they have to cross to get to where they wish to go. However, the traveller must bring their fox, chicken, and bag of grains to the other side as well, but the bridge is only strong enough to carry one of them at a time. If the chicken is left alone with the grains the grains will be eaten, just as the chicken would be if the chicken was left alone with the fox. How does the traveller manage to make it across with the sack of grain and both of the animals? As mentioned there are other variants of this puzzle, they are as follows. Three couples have to reach an island by boat. Unfortunately the boat can only carry 2 people at a time, and the husbands are so jealous the wives cannot be in the presence of another man while their jealous husband isn't present as well. How do they cross? Without divorcing their overly jealous husbands of course. There are 4 people who need to cross a bridge at night. Unfortunately they only have 1 torch left, which is absolutely needed to cross the bridge safely. There's only 15 minutes of burning time left on the torch, so they'll all have to cross in 15 minutes. Unfortunately only 2 people can cross it at a time. Furthermore, person A can cross the bridge in 1 minute, person B in 2, C in 5, and D in 8. If two people walk together they'll walk as fast as the slowest person. How do they all cross the bridge in 15 minutes? The problem in all of these tends to come when the second person, item, or animal has to be moved. If you move the chicken first, what do you bring next? If you bring one couple first, who returns with another husband or wife? The problem in the Bridge and Torch problem is slightly different, but I'll reveal the answer later. In the first two problems you do know some first moves are definitely the wrong one though. You can't take the fox or the grain first for example. The solution is really simple, the problem is that most people forget they don't just have to stick to bringing something somewhere, they can also bring it back again later. - Bring the chicken across first. - Go back, take the fox across. 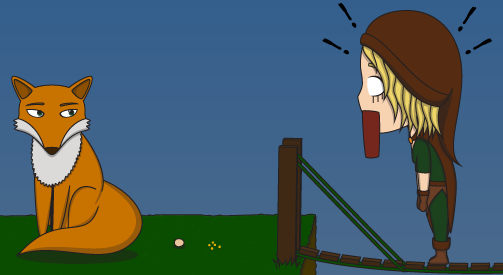 - While across, pick up the chicken and return, leaving the fox on the opposite side. - Put the chicken down at the start. Pick up the grain, bring it across to the fox. - Go back to get the chicken and bring it to the other side. Done! - Husband A and wife A go first. - Wife A goes back, picks up wife B, and together they go to husband A. - Wife B returns, picks up husband B, brings the husband to the island, then returns alone. - Wife B picks up wife C, goes to the island, and steps out. - Wife C goes back, picks up husband C, then they go to the island. Done! - Send A and B together. Which takes 2 minutes. A then returns, taking another minute. - C and D now cross together, taking 8 minutes (so 11 in total). - B returns, taking 2 more minutes, picks up A and they take 2 more minutes to get to the other side. 15 minutes total, done! Adapting these puzzles to an RPG setting isn't difficult at all, all you need to do is replace each element in the puzzle to fit your story universe. Instead of a fox, chicken, and bag of grains, you could have a dragon, cow, and bay of hay. Instead of 3 couples you could have bounty hunters and apprentices. Just make sure the puzzle is actually solvable, or else the result will be the same as making a mistake. Poor chicken. The oldest recorded river crossing puzzle was posted in a manuscript called "Propositiones ad Acuendos Juvenes", meaning "Problems to sharpen the young". This manuscript dates back to the 9th Century. Variations of The Fox, Goose, and Bag of Beans are also found in Native American, Danish, Italian, Scottish, Zambian, Russian, and many other folklores as well. This makes this puzzle ideal for any lore driven points of an RPG campaign, since not only is it common in our history, the puzzle itself could tell a mythological story of sorts.